Student Recitals are great because they give students a goal to work towards, giving their lessons more direction and increasing the student’s motivation for making progress on their pieces. Parents and grandparents also love them, because they get a chance to watch the students play their pieces onstage. Assign music to each student 2-3 months (or more) in advance. I recommend buying new sheet music for the student, because there is something special about learning music outside of the usual lesson books. Begin working on a piece of music yourself — it’s so important to play a piece at the recital along with your students. Students will look up to you for going through the same recital-preparation process that they are going through, and parents really enjoy hearing the teacher play as well. Choose a location. Some options: your home, a church, a student’s home, or a retirement home. Prepare any certificates or prizes that you may want to award at the recital. One year, I gave each student a long-stem rose after their performance (be sure to cut off the thorns!) — they were a real hit. If you wish to have some post-recital fellowship time, you may want to check with the parents to see if any are willing to help out by bringing cookies, brownies, bars, or punch. Buy napkins, cups, plates — whatever you need for the refreshments you wish to serve. Type up a program for the recital, listing the students names and the pieces they’re performing. Make enough copies for the students and their families. On the day of the recital, arrive early to set things up. Make sure the piano is set up appropriately. Set up any video camera or recording devices you may wish to use. Write each student’s name on a program and use the programs to mark where the students should sit during the recital. Put the rest of the programs on a music stand near the door. Set up the refreshment table where everyone will mingle afterwards. Ask your spouse or someone to take pictures of each student as the recital progresses, and find a good place for them to sit. Once everyone has arrived, make opening comments to welcome everyone before the students play, following the order of the program. At the end, award any certificates, prizes, or flowers and encourage parents/family to stay afterwards for refreshments. Put up photos on your website for the students and their families to enjoy. If you don’t have a website, you could email the pictures to each student. Send thank-you notes to each person who volunteered to bring refreshments, and perhaps also to the person who hosted the recital (or the janitor, as the case may be). If you recorded the recital, put the recording on a cd or dvd and mail it out. Or, make it available on your website or on YouTube. Do you have some great ideas that you use at your Student Recitals? Please feel free to share them by leaving a comment below! 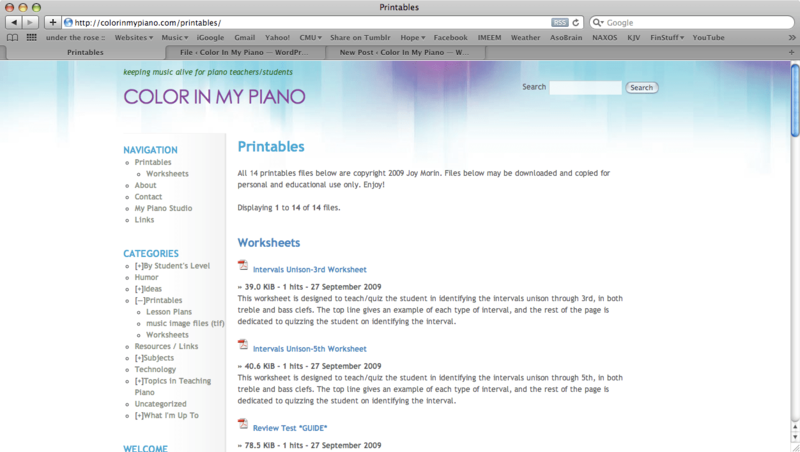 If you head over the the Printables page, you will see that it has undergone a complete makeover! I was having a great deal of difficulty with the WordPress plugin I was using to organize and display my printables, so finally I scrapped it totally and found another one. Although it is not as fancy as before (i.e., there are no longer any preview thumbnails of each file), it gets the job done! You can also simply visit the Printables page to see a listing of all the pdfs currently available. Enjoy! Newsletters. Create a monthly or bi-monthly newsletter, and send it out via email or snail mail. In it, congratulate student accomplishments (participation in competitions or other music events) and make announcements regarding future events. Studio website. Start a studio website, which you can regularly update with news and announcements. If you choose to have a blog on your website, parents can subscribe to email updates and receive an email version of each post you create. Hold a Parent-Teacher Meeting. Once or twice a year, you way wish to hold an informal meeting where all the parents (at least one parent per student) come to discuss anything and everything related to the piano studio. You can make announcements concerning future events, and discuss past ones. It’s a great way to get feedback from the parents concerning the way you are running your studio, and to get suggestions concerning how to run things next year. Serve dessert and coffee to put everyone at ease, and keep it under an hour or so. Personal calls or emails. Once in a while, it may be appropriate to call or email a parent directly concerning a student’s progress. I think this is especially important for when you are convinced that the student is not progressing as well as s/he could be. Letting the parent know about your concern opens the door for their cooperation with you in further action. Progress Reports. At the end of the school year, it is advisable to create and fill out a progress report for each student. It not only helps you wrap things up, but helps communicate to the parent concerning what kind of progress the student has made under your instruction over the past year. Evaluations. At the end of each school year, it is also a good idea to create a Studio Evaluation form for the parents to fill out, concerning what they liked/disliked about lessons and studio events over the past year. Getting feedback from the parents is extremely helpful for planning the following year’s events. How do you maintain the ways of communication with parents? Let us know by commenting below. . . .and other random pieces by composers such as Mozart, Clementi, Listz, and Brahms — including an arrangements of Pachelbel’s Canon in D and Rimsky-Korsakov’s Flight of the Bumblebee. 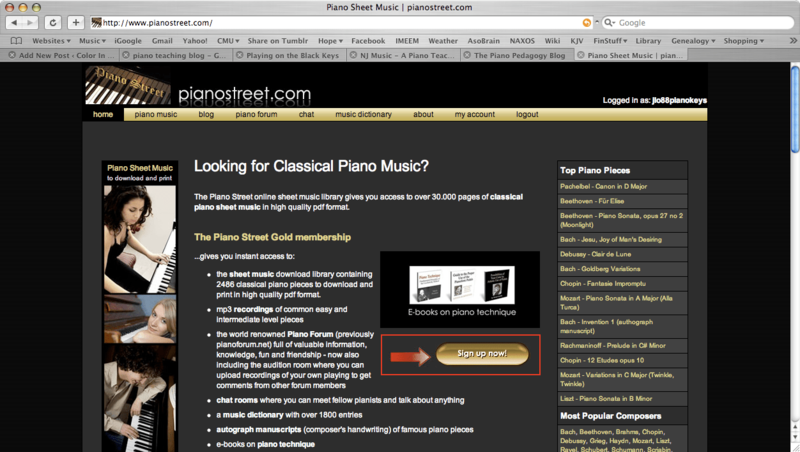 If you upgrade to a Gold Membership, you’ll have access to even more music. Personally, I am planning to stick with my free Silver membership. I am thrilled to be able to print (for free!) these great classics for my students, particularly for the ones with little money to spare for piano lessons during these rough economic times. you dream in four parts. your biological clock follows a non-retrogradable isorhythm. 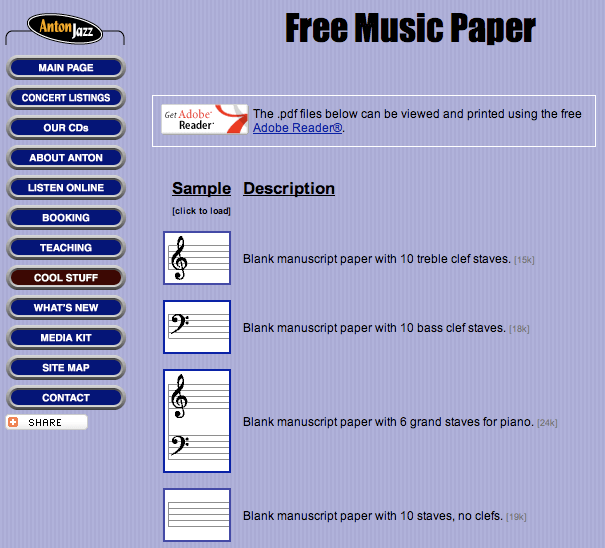 There are hundreds of sites out there that offer free manuscript paper (aka staff paper). But this is my absolute favorite. Now, you must know, I do a little composing every now and then. And I have discovered that I am a very picky manuscript paper person. It has to be just right. I always print the “Blank manuscript paper with 10 staves, no clefs” paper. It’s very economical and flexible. It’s professional and clean-looking. But I love this manuscript paper for myself and my older students to use. It’s perfect for that. Do you have a favorite manuscript paper, as I do? Please let us know by commenting below.